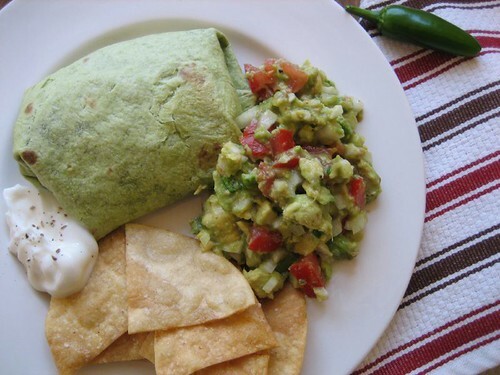 Bridget’s been making these black bean burritos for years. They’re very simple. She sautees yellow onions, garlic, mushrooms and black beans until they’re all hot and bubbly. A little S&P and then she wraps them in some green tortillas and bakes them at 350 for 10 minutes. I made the guacamole tonight. Two avocados in the bowl. Squeeze over a lemon to keep them green and beautiful. Dice an onion (I used white, red would probably have been better), toss it in. Dice a garlic clove, toss it in. S&P and few dashes of hot sauce, and we move on to the tomato. Cut a tomato in half and squeeze out all the seeds. Dice it, toss it in. Mix everything up until it’s still chunky, but well combined. Taste it. I wanted a little more heat, so I picked a couple jalapeños from our garden. Dice them, throw them in. We were out of chips, so I quartered a stack of corn tortillas and fried them up. Three minutes and a little kosher salt later, we had chips.